Topgolf offers an upscale and playful experience, featuring an impressive food and beverage menu, music, games, complimentary club rentals and HDTVs. Whether it's a date night, girls' night, happy hour, work breakfast, lunch hour or any other kind of hour, Topgolf makes socializing a sport – literally. Players hit golf balls containing computer microchips that track each shot’s accuracy and distance while awarding points for hitting targets on the outfield. You can challenge your friends and family to several different point-scoring golf games that anyone – from beginner to the golf pro – can play. Plus, with climate-controlled hitting bays, Topgolf can be enjoyed in all seasons. Topgolf also brings interactive experiences to the community that facilitate shared moments and deep relationships through Topgolf U golf lessons, weekly leagues, The Topgolf Tour competition, KidZone parties, social and corporate team-building events, and the World Golf Tour (WGT) app. With venues across the country and the world's largest digital golf audience, Topgolf is creating the best times of your life both in-venue and online. This card is issued by and represents an obligation of Topgolf Pro, LLC. Purchase or use of this card constitutes acceptance of the following terms. Card cannot be redeemed until activated. Purchases made with the card will be deducted from the balance until it reaches $0.00. 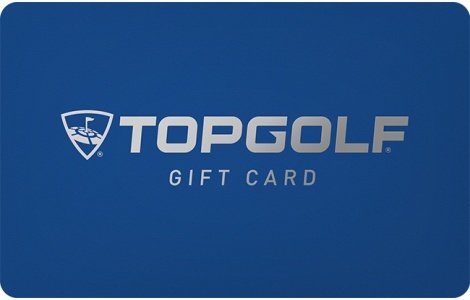 This card is redeemable at any Topgolf location in the United States and online at participating Topgolf sites. It cannot be redeemed for cash except where required by law. Treat this card as cash, as it will not be replaced if lost or stolen, except where required by law. This card has no expiration date and incurs no dormancy fees. Topgolf reserves the right to amend these terms from time to time, as provided at topgolf.com. For balance, visit topgolf.com/cardbalance.